He’s been doing it all season long, putting in the best season of his brief MLS tenure, and he’s been underappreciated and overlooked all along, just like he has been most of his career. 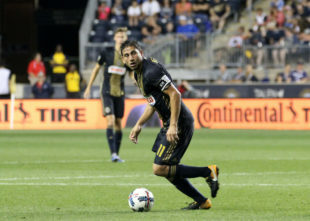 And after another great, underrated performance in Philadelphia Union’s big win Saturday over New York City, Union captain Alejandro Bedoya is PSP’s Player of the Week. It’s the small things, like his run toward goal that drew defenders to clear space for Borek Dockal to find Cory Burke for the Union’s first goal. It’s his full-firing engine that leads to him providing defensive coverage all over midfield, allowing the team to deploy a deep-lying regista in Haris Medunjanin as their No. 6 and play without a true defensive midfielder. His combinations in the center of midfield have been crucial in creating the triangles that provide options for the quick ball movement and possession play that the Union have dazzled with of late. And he’s been creating in his own right. Really, Bedoya has been doing it all of late, and we thought it was about time to recognize him as PSP’s Player of the Week. He has become the glue player the Union projected him to be. Borek Dockal. Because the Union No. 10 had two assists and four more key passes in another fantastic outing. Yes, we had great choices this week. All put in great performances. It was a good week in Philly soccer. It’s nice to have dilemmas like this! Bedoya has been key to our possession game this season. Both in keeping the ball and moving it, as well as winning the ball back once we lose it. Such a solid two-way player. I probably would have given it to Ilsinho for his comeback game – he was solid and pushing defenders for his whole time on the field. But it’s good to see Bedoya get the nod for his steady work – season achievement award. Good link! Thanks for adding it. We still love Adam, and he’s as good as soccer analysis gets in the U.S. I second CPfief’s recommendation, both because of the content’s message and because of the author’s perceptivity and intelligence. He can decipher American Soccer Analysis, in other words.